Every Dave & Buster’s has private rooms that come complete with everything you need to host the perfect meeting! We'll work with you from start to finish to make sure every detail is right. Best of all, when work is done and it’s time for fun, our Million Dollar Midway is ready for action with hundreds of state-of-the-art games. Select one of our breakfast and/or lunch packages and host a meeting or conference unlike any other. 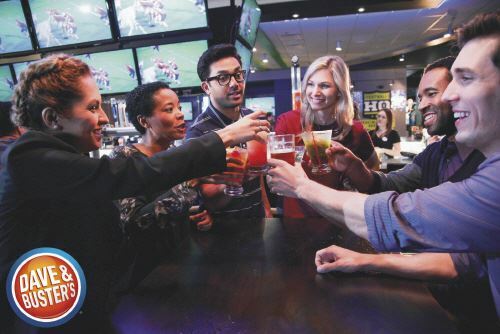 With private rooms and AV equipment, Dave & Buster’s the perfect combination of business and fun. Plus, we've got plenty of space for breakout meetings or smaller group activities. Please see attachment for all package details. Please see attachment for all package options. Call store for details, promotions, & revenue minimum requirements. Kid's Birthday Party Package - Food, soft drinks, game play & 2 hrs. in an event space for all ages! Package pricing does not include tax and gratuity. Packages may vary by market and day and time restrictions may apply. Social Party Packages - Food & Game Play all conveniently packaged for your group! Social Party & Play Packages include a buffet & game play at a discounted rate! Soft drink & bar packages are sold separately. Please see attachment for all package options. Call store for details, promotions, & revenue minimum restrictions. Our Hi-Life bowling lanes includes 12 bowling lanes and an exclusive full-service bar. Atmosphere/Decor: Open Banquet hall - neutral palette, gray carpet. Table & chair set up customized based on guests' requests. Rectangle & round tables available. Table linen & fabric napkins included in room rental. Special Features: Full audio/visual capabilities included: 60” drop screen, projector, PC laptop hookup, CD player, iPod hookup, WiFi access, lectern & cordless microphone. Special Features: Full audio/visual capabilities included: 96” drop screen, projector, PC laptop hookup, CD player, iPod hookup, private restroom facilities, lectern & cordless microphone. Our NEWEST EVENT SPACE, the Ultimate Sports Lounge is available to rent in two sections: “The Locker Room”: This portion of the Ultimate Sports Lounge can hold up to 30 guests. This semi-private space includes big-screen TV’s, 3 billiard tables, high-top tables & lounge seating. Sports Lounge Dining Tables: Perfect for groups watching the big game or an after-hours event with your co-workers, groups of 10-25 will fit nicely at these tables. This space is only available Monday-Thursday, and cannot be used for buffet service. Atmosphere/Decor: Sports Lounge atmosphere - bar-height tables & booth seating. 18 big-screen TV's & 2 180" projector screens create the Ultimate Sports Watching experience! Viewpoint 2 is a fully enclosed, private event space, and can hold up to 80 guests. It includes the following amenities: 2 billiard tables, dining tables for seating, 4 big-screen TV’s, & patio access. Special Features: Projector & screen available at an additional cost in this space. NO AUDIO available - visual capabilities only. Viewpoint 3 is a semi-private, open aired event space, and can hold up to 45 guests. It includes the following amenities: 2 billiard tables, bar-height dining tables, 1 shuffleboard table, & 3 big-screen TV’s. The Hilton Garden Inn Charlotte/Ayrsley hotel is nestled in the heart of Ayrsley, a pedestrian-friendly neighborhood of businesses, restaurants, shopping and entertainment. The hotel's location offers easy access to downtown Charlotte and Charlotte/Douglas International Airport. With 5,000 sq. ft. of flexible meeting and event space, catering services and a 24-hour business center, we have what you need for a successful business or social event. Looking for a new and exciting place to host your event? The NASCAR Hall of Fame provides you with a venue where you can experience it all. Have a reception encircled by NASCAR memorabilia in the Great Hall, eat dinner beside a NASCAR Hall of Fame Inductee’s car, or host a private event in the Legends Room. Whatever you desire for your event is possible at the Hall. Wild Wing Cafe is your premier home for your event in the heart of Downtown Charlotte. We offer a completely renovated space with full service customizable catering and beverage services, full stage, AV package, and plenty of space for up to 460 of your closest friends. We can host several different types of events from your office party to a fun reception. Concord City Club at Gibson Mill, located in Concord, NC, is housed in a 100 year-old beautifully restored classic red brick southern mill. The site was a historic plant which produced fine American Made bedding until the shifting global economy changed the way business was conducted. Manufacturing went overseas to China and India, and the plant was left empty. Four friends walked around a huge complex, nearly 700,000 square feet located on 58 acres of real estate about one year after it was closed. "If these silenced buildings could talk," they thought, "imagine the stories they could tell." They decided to pursue a purchase of the complex and bring activity back to its buildings. Then came the birth of the City Club at Gibson Mill, Venue of Distinction and Concords only Private Club! This industrial, vintage-style facility hosts uniquely memorable events including weddings, corporate events, tradeshows and celebrations of all types! One of the most unique attribute of Concord City Club is a design feature that allows automobiles to be brought into the space. Choose from the Auto Barn or bring your own classics! Concord City Club has 15,000 square feet of divisible event space with lighted paved parking for more than 500 vehicles. Our outdoor portico is multi-functional, useful as a covered entrance for your vehicles or as a covered space for outdoor entertainment. We also have the capability to re-create our venue to cater to areas for auction items, registrations, or additional booths in a trade show application. For years, City Club at Gibson Mill has been a top-choice referral venue for both leisure and business oriented events. Weddings, Fashion Shows, Birthday Parties, Concerts, Galas, Tradeshows and SO MANY more event types call us their "home" base location. We value our customers and make sure that their happiness is our priority. As a privately owned venue, we have the advantage and opportunity to make every experience a personal one. We are here to serve you and provide the ultimate satisfaction guaranteed package. Gorgeous Venue, Bring Your Own Food/Alcohol, $1299/Saturday. BanquetOne is an affordable yet elegant Venue for weddings and other events. Located in Charlotte near Huntersville, the rent includes refrigerator, ice-maker, dvd player, cd player, 2 60" HDTVs, Sound System, tables, chairs and tablecloths setup by us. No cleaning fee. No taxes or gratuities. You can choose any Caterer of your choice or bring your own food/drinks/alcohol. Ideal capacity is maximum 120 guests. Up to 150 guests is also possible. Very high speed free Wifi is included. Only for parties with guest count of 60 or under, ideal space for both Wedding and Reception for the same price. Parties with guest count of above 60 only enough space for reception. Breathtaking outdoor backdrops and comfortable indoor spaces create a powerful setting for the most important events of your life. With a focus on elevating your experience without breaking budgets, Spinning Leaf will wow you with a beautiful and versatile facility coupled with the best hands-on service around. The 12 acre vineyard event rental venue is located in Shelby, North Carolina, conveniently located within an easy driving distance from Charlotte, Spartanburg, Hickory, Asheville, Greenville and Gastonia. Come for a visit soon and let this place capture your heart. The Q serves up a melding of styles from eastern NC, western NC and SC created from cherished recipes. We also believe great Q means serving the freshest, most amazing meats smoked low and slow with homemade sauces on the side. This way you can sauce them in whatever style you want. Or not. That’s Queen City Q. And here… It’s All About the Q. Whether you have a small group of friends getting together, an after work happy hour or a large event for hundreds of people – we are the perfect place for your next event. Book our intimate, private dining room, our casual, lively top bar, or all or part of our main dining room or any combination of these spaces to accommodate your group. You can event reserve the entire place for your large or exclusive event! With banquet facilities that can accommodate small, intimate gatherings or grand-scale events, our staff and facilities set the ideal scenery for your event. Conveniently located in Huntersville and the north Charlotte area, NorthStone Country Club is the ideal location for your special event. Our wedding packages include all of your food and beverage needs, and our friendly staff will accommodate you and your guests throughout your event. Whether you're looking for a ceremony site, reception venue, or both, NorthStone Country Club will ensure that your day goes off just as you've always envisioned.